Sandrock Elementary School fourth and fifth graders spray principal Kamisha Siminoe with silly string Friday afternoon in the gym. Siminoe allowed any student who met her challenge of selling 20 items during a school fundraiser to spray her. Covered in ribbons of Fiesta String, Sandrock Elementary School principal Kamisha Siminoe looked like a neon swamp monster standing in the middle of the gym Friday afternoon. Students in the bleachers roared with laughter and egged classmates on as they took turns emptying cans of silly string on Siminoe. 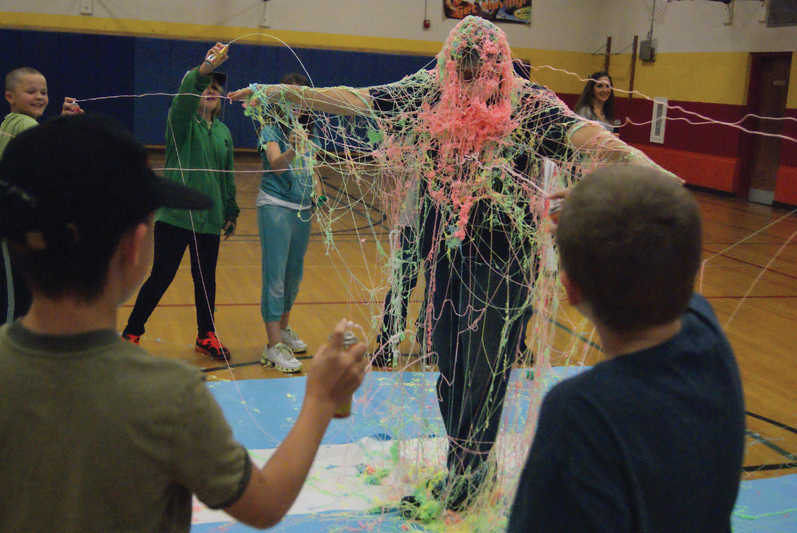 As an incentive for her students to do well and sell during the school’s fundraiser, Believe Kids, Siminoe challenged any student to sell 20 items from the catalogue for the opportunity to spray her with silly string. About 45 kids rose to the challenge, and the entire school sold $33,000, netting over $14,000 for the school accountability committee. Siminoe said a Believe Kids sales rep initially told the school to consider a goal of $10,000, but Siminoe said she told him they could do better than that. So they set it at $15,000. Siminoe said she knew if she pitched a principal’s challenge to the kids it would increase participation. “The kids have really been talking about it for a couple of weeks. It’s all I’ve heard about today,” Siminoe said. And although silly string has silly in the name, it may not be the silliest thing she’s done. Siminoe said she’s been duct taped to the wall before (sticking nonetheless) and she’s also kissed a bulldog. “I had slobber dripping down my chin,” Siminoe said. Siminoe said she would really like to thank the community and parents for their support of the students, along with Moffat County School District staff.